Utilizing a ‘coach approach’ with oneself and others enables quicker and more effective progress towards goals. This book identifies the crucial coaching qualities and actions to increase motivation, engagement, and performance. Through exercises and examples, I demonstrate how to ask compelling questions, how to create effective action by constructing SMART goals, and how to hold yourself and others accountable. Additionally, I show how presence and attitude, active listening, compelling questions, setting goals and accountabilities, and encouragement and feedback will help you coach others. Drawing from neuroscience, case studies and personal experience, you will learn how to use these specific techniques to create more fulfilling relationships and results. 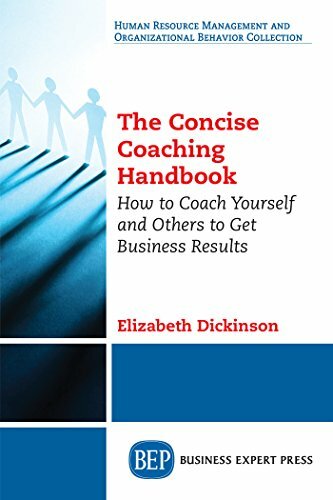 The Concise Coaching Handbook ends ends with three brief case studies of for-profit and non-profit organizations who have committed to creating a ‘coaching culture’ and the benefits they’ve received. In my book I also recommend using guided meditations to reduce stress. Here’s one I recorded that you can listen to anytime for a quick pick-me-up. My clients have told me they feel calmer, clearer, and more able to deal with what life throws at them. Everyone deserves and needs at least 5 minutes of calm every day!